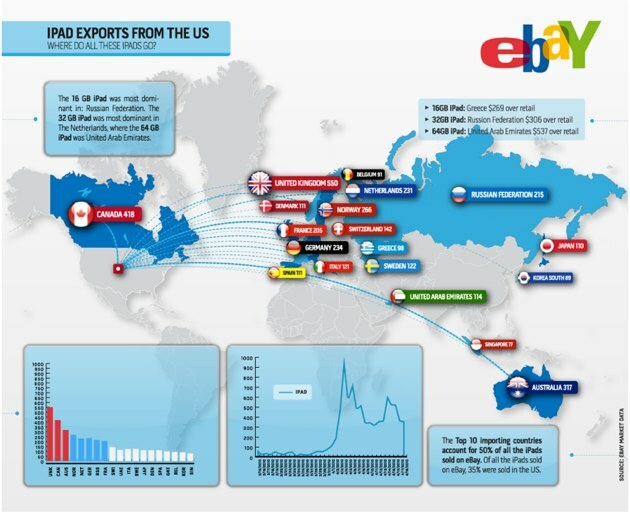 Since iPad’s launch, eBay has sold more than 5,300 units across the world, 65% abroad and 35% at home, according to data from eBay that spans from mid-March to mid-April. The UK dominated international sales, with 550 units sold, or roughly 15% of foreign sales. But buyers from the United Arab Emirates were willing to shell out the most cash, with the average buyer paying a hefty premium of $537 (!) for the 64GB version (more than enough to buy a bare bones 16GB Wi-Fi model). That was the highest average premium for any model— buyers in Greece paid $269 over retail for the 16GB version, Russians paid a $306 premium for the 32GB model. Overall, Europe had the strongest showing, with nearly 2,300 units purchased. The demand on eBay should subside somewhat in the coming months, as Apple finally makes progress on its international launch. Starting May 28, the iPad will be available in the UK, Australia, Canada, France, Germany, Italy, Japan, Spain and Switzerland. Then, at some point in July, the iPad will be available in Austria, Belgium, Hong Kong, Ireland, Luxembourg, Mexico, Netherlands, New Zealand and Singapore. However, the high-rolling UAE is noticeably absent from this list, which could support those high prices for quite awhile. 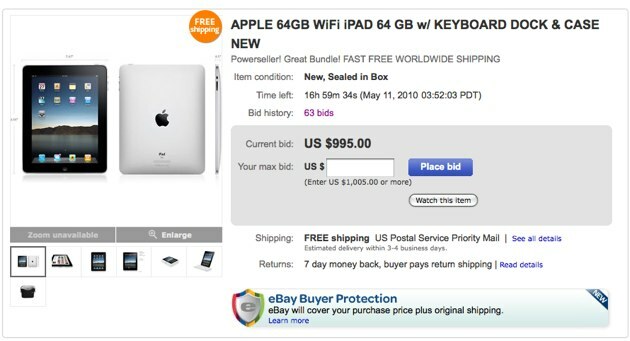 As of today, there were a few live auctions on eBay with several bids for the 64GB WiFi model north of $900 (+$300 premium). Look at this auction with 63 bids, it’s at a current price of $995.00 with more than 16 hours left. I sympathize with the international buyers who are paying huge premiums because of the slow Apple rollout— spending $200, $500 more for an iPad is outrageous but justifiable in the context of scarcity. What truly baffles me is why my fellow Americans, who make up 35% of these eBay purchases bought the iPad (presumably for a premium) on eBay. Considering the lack of in-store shortages and Apple’s free domestic shipping, you really have to wonder what those Americans—with more than 1,800 units purchased— were thinking.